Baking can be SO intimidating, but after several years of baking (and lots of trial and error) its definitely become something that has saved me lots of money in the long run. If you plan on making cakes for parties for your kiddos, holidays, or family get togethers it will really come in handy. So get in there and try it! I want to start by saying, I did NOT bake this completely from scratch. I have done it, its great, but using a cake mix or doctoring up a boxed cake mix always tastes just as good. The key, in my opinion is the frosting. Making that from scratch is super easy and is well worth it. I will be posting the recipe in this post. My oldest wanted an oreo cake, so I made two batches of frosting. One being regular buttercream, and the other with crushed oreo cookies to give each cake an oreo buttercream center. One cake was chocolate, and one was vanilla, both with oreo buttercream filling and buttercream frosting- and I’ll be sharing this recipe. It is my go-to and favorite buttercream recipe of all time! I used this cake mix from Target, it was honestly THE BEST box cake mix I had ever had and I didn’t doctor it up (more on that later in the post), I just followed the directions. I try as much as possible to stay away from unenriched foods, without folic acid because of some genetic things with my family so I always read the label and there are some brands I always use now because of that. This was one of them. I baked two 9 inch round cakes, greasing the pans with the flour baking Pam before putting them in the oven. Take them out, let them cool for 10 minutes, then flip them over on a cooling rack and let them fully cool before frosting. While the cakes are cooling, start making your frosting. This is the recipe I used, and ALWAYS use. This works for cakes as well as cupcakes. You can add color or leave as is! For the oreo buttercream, I just took 15 oreos, put it in a galloon freezer bag and had my youngest crush them for me. When one of the two batches was done, I just folded the oreo cookies into the frosting and used that for the middles of the two cakes. The left overs were consumed on top of MORE oreos by the boys. Put two sticks of butter, 2 T milk and 1tsp vanilla in the bowl of a stand mixer (a hand mixer will work if you don’t have a stand mixer). Mix on LOW speed just until it starts to come together, about a minute. Scrape the sides of the bowl with a spatula. Increase to medium low speed and beat for about another minute. After this it will be combined, with a little liquid at the bottom. Increase the mixer speed to medium. Beat for about another or minute or so. When it looks creamy, and combined you’re ready for the next step. Add 4 cups powdered sugar. Beat on low speed until sugar is just barely incorporated. Now scrape down the sides of the bowl, and INCREASE speed SLOWLY to medium. Beat for about a minute. Now you will want to check your consistency. This is very important because if your frosting is TOO THICK, it will not spread well. Take your spatula and move it around in the frosting, if it does not glide through the frosting, add about a tablespoon of corn syrup and beat on medium for about 30 seconds. You can do this regardless, it will safeguard you and make it nice and spreadable. The frosting should hold it’s shape without being too thick, think of toothpaste consistency. If it is too runny, it will slide off and will not stick to your cake. If you are wanting to pipe some decorations on your cake/cupcakes, now would be the time to set a little of this aside in a separate bowl to use later. 5. 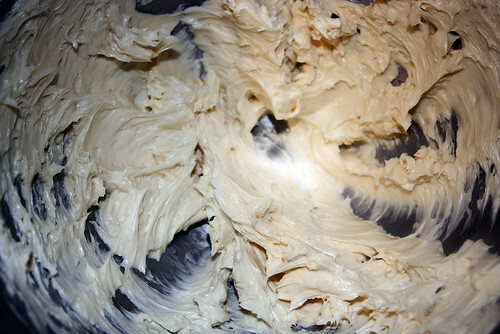 Once you get your frosting to a good, spreadable consistency, increase mixer speed to medium high and beat for one minute. This will get your frosting nice and fluffy. Now thats it! You’re Done! This is SO delicious, and I know you will agree! If you want to add any dye (or multiple) to you cake, separate if you want more than one color into little bowls and add whatever dye you like to each bowl. Then you’re ready to frost and assemble! Because I try to avoid dyes I used this powdered natural dye from McCormick, and it worked great. I bought it on Amazon and there are some other natural gel food coloring available there as well if you don’t want to search high and low in stores. You can use the regular gel food coloring as well. I took my bread (serrated) knife and gently leveled the top of the cakes. I got down to eye level with the cakes and GENTLY took my knife and ran it over the top of the cakes evenly to eliminate the minor curve the cakes get when baking. When I was done, I was left with two pretty flat and even cakes. I put a small dollop of the frosting on the cardboard, then set one of the layers on it to secure the bottom piece. Then I took the bottom cake piece, and set it on a cake server (with a cake cardboard underneath). I then added the top piece to the one attached to the cardboard and with the filling spread on. Think of it like putting a PB&J together. Put it on and TADA, all ready for the crumb coat. Here is a picture of the smashed up Oreo pieces folded into (one of the two) batches of frosting I made. Now comes something called the “CRUMB COAT”. Crumb coat is the first layer of frosting, and there will be bits of crumbs in it because the cake gets another layer of frosting. You take your frosting with your frosting spatula, and lightly, make an almost messy look to the cake as you spread it all over. I like to start on the sides, spread the frosting all around, not being concerned with the crumbs because THEY WILL GET COVERED UP. Then work my way to the top, and spread it out evenly, smoothing out an ridges on the edges of the top, but you don’t need to make it perfect in this step. Set it in the fridge for about 30 minutes to become less tacky and then take it out again to frost it again. ** For this nerf party, I did NOT do this, simply because I would be covering up the sides of the cake with her bullets. Im only explaining for those who will not be covering the sides of their cake. If you are mimicking this cake, then just do a messy coat on the sides, smooth the top (while trying to keep crumbs to a minimum on the top) and then stick on your nerf bullets. You do not need to put it in the fridge or do a second coat because the sides will be covered by nerf bullets. Add any decorations you want to the top, and voila! You’re done! Take your cake out, and if the frosting isn’t tacky then proceed with another layer of frosting, smooth the sides as you go, and there shouldn’t be crumbs in this coat, because they were sealed in when you did the initial crumb coat. This is what gives you a nice looking cake. Take your time, ideally use something that spins, like a lazy susan or a cake decorating pan that rotates. As I frost I spin it with my left hand and keep the spatula parallel to it and it REALLY smoothes it out nicely. Practice makes perfect, you just have to get in there and experiment. I like to start on the sides and finish the top last, smoothing the edges (while rotating the cake on my lazy susan) as I go and then you’re done! Lastly- one tip I read that I do often is to DOCTOR up your cake mixes. This makes them moist and taste like it was made from scratch.. when it wasn’t! Here is what you do with any boxed cake mix. Doctored Cake Mix...Make Them Think It's From Scratch! Combine butter with the remaining ingredients in a medium bowl. Mix on low for 1 minute. Then mix on HIGH for 1 minute. This will give your cake a nice creamy and thick texture- not thin and runny. You will taste the difference. *cake is done with a toothpick or my favorite tool is inserted and comes out clean. My mom always said, when you smell it, its done. So humor her, and check on the cake if you really smell it and the timer is still going. It could be done! I hope this gives you an idea how to assemble your own cakes, and help you with your baking! Thanks for reading!